"The Father of Radio Broadcasting", Reginald Fessenden, the eldest son of an Anglican Minister, was born in 1866 in East Bolton (near Sherbrooke), Quebec. His boyhood years were spent in Ontario - first in Fergus (north of Guelph) and later in Niagara Falls. 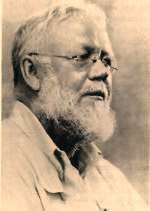 From his home in Fergus, Ontario, Fessenden closely followed the work of Alexander Graham Bell Bell, and he never forgot his dream of transmitting words without wires. When he was only 10 years old, Reginald watched Bell demonstrate the telephone in his lab in Brantford, Ontario and later make the first long distance phone call in history, from Paris to Brantford, Ontario. 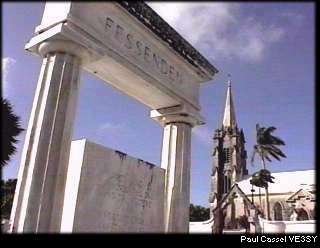 Discovering a way to broadcast human voice by radio is only one of Fessenden's accomplishments - during his life he came up with over 500 other inventions including the Fathometer or depth finder which are reflected in the words of the memorial above the vault of Fessenden's final resting place (see top photo) on the island of Bermuda. Dr. Jack Belrose of the CRC in Ottawa recreated Fessies early experiment with similar success. Click here for the story.